Those signals were nothing like the huge illuminated arms that block every lane of traffic these days. They were simple “wig-wag” signals, with a bell and a couple of blinking red lights. Hanging off the bottom was a tail like thing with one of those blinking lights. When the men activated the signal, a tail wagged back and forth to catch drivers’ attention. 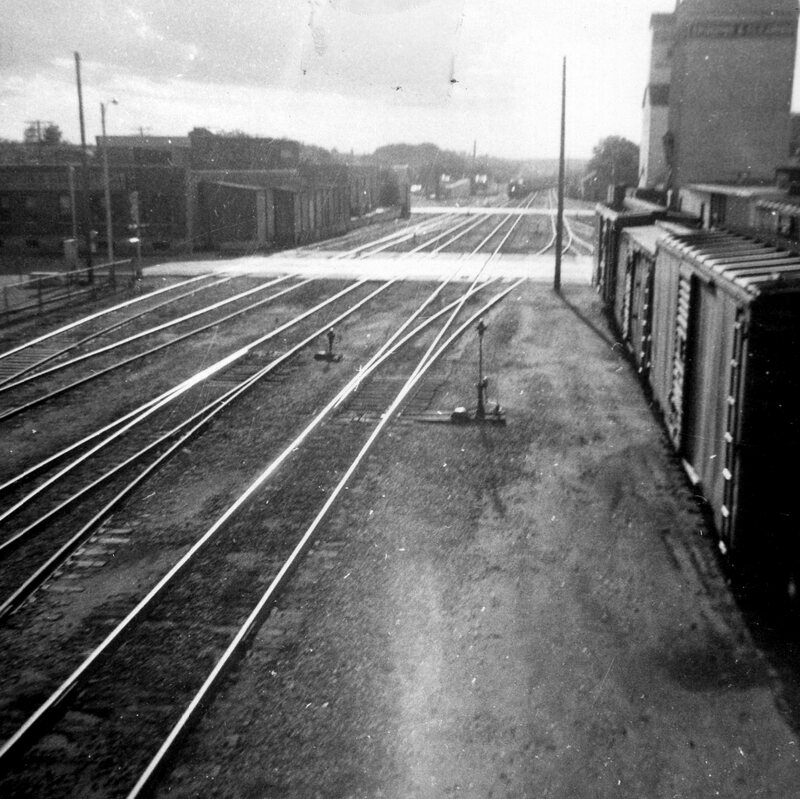 Eight or ten passenger trains, and many more freight trains, came through every day. The guys in the tower didn’t get much time to nap. Every time a freight train passed by without stopping in the yard two men would show up from somewhere to watch the train go by. 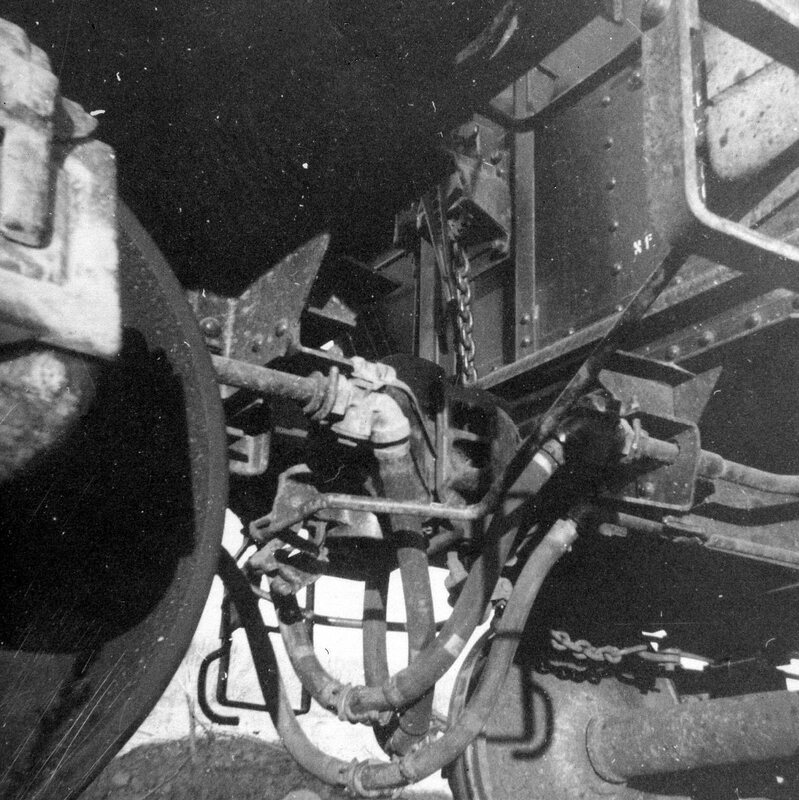 They stared intently at the wheel assembly (trucks) under each freight car, looking for the tell-tale signs of a “hot box.” Wheel and axle technology hadn’t advanced much. The wheel bearings needed constant lubrication with grease applied through a door on the end of the axle. On rare occasions a wheel bearing would go dry, eventually catching fire, and in the worst case would cause a derailment. The men on either side of the track watched for smoke. I presume that if they saw something, they’d note which car and telegraph ahead to the next town to get the axle serviced. 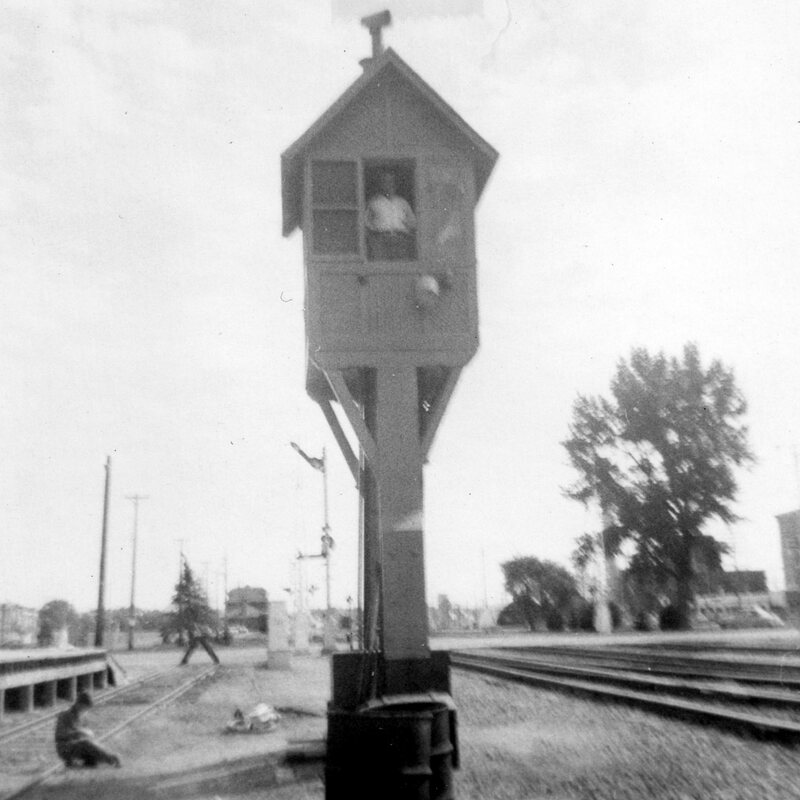 Just beyond the switching tower was the passenger train station. 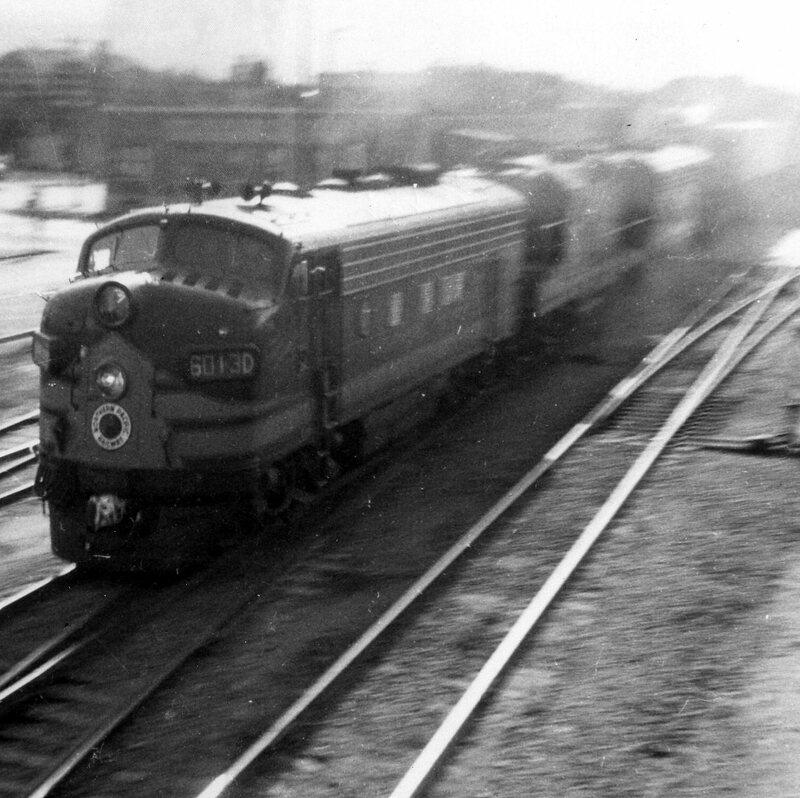 Activity swirled around the station when a big train stopped, which was four times a day. 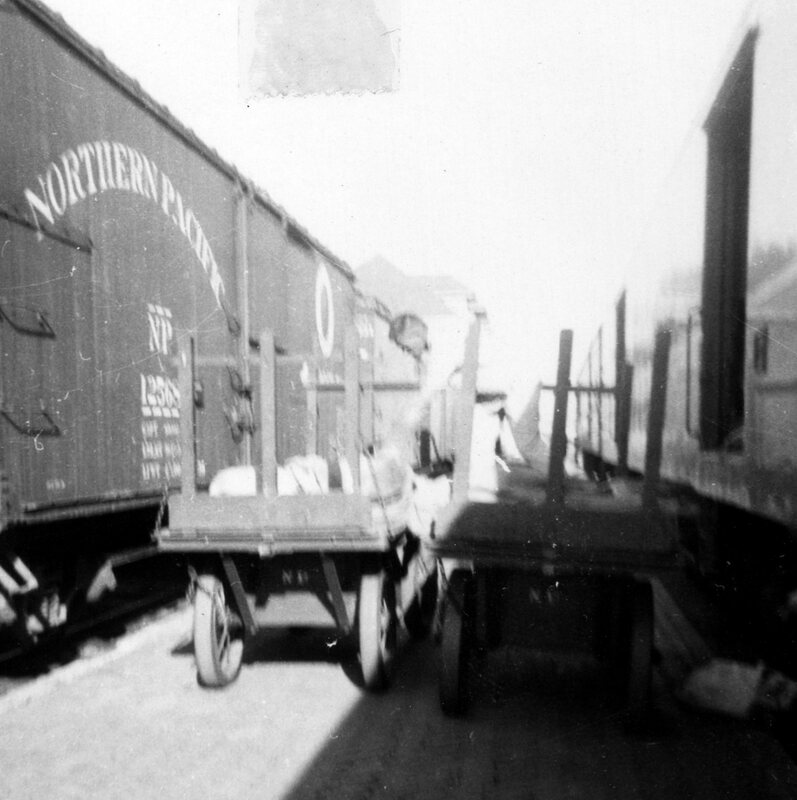 The instant a train stopped, workers wheeled huge wagons into place by the mail cars. All mail to the town came on one of these trains. Just behind the mail cars were baggage cars, which generated another wave of activity. Next were the passenger cars, where dozens of people disembarked or climbed aboard every train. Conductors inspected the trucks and undercarriage of each car. Flagmen stood ahead and behind the train signaling to other trains and to the engineer on the train, telling them what to do. The noise, smoke, steam and activity kept me entertained for years. Inside the station, the activity didn’t hold my interest as much, but I did like to snag a copy of the train schedules, look at where the mail and baggage went, and wonder where everyone was going. I miss that train station, but not as much as what was at the other, west end of town. All the real action took place down there. The first stop was “The Beanery,” where rail workers gathered for lunch and dinner, or maybe a cup of coffee. On the rare occasion when I had a nickel, I bought candy there. Across the street were the coal, water and sand towers that serviced the steam locomotives. Steam was on the way out when I was wandering around in those days, almost entirely gone by the time we moved away in 1960. Across the switching yard was a giant gravel pit we loved to play around. There were cliffs of sand, and ponds of water to play in. To get there we’d have to dodge the “highball” trains and switch engines working the yard. 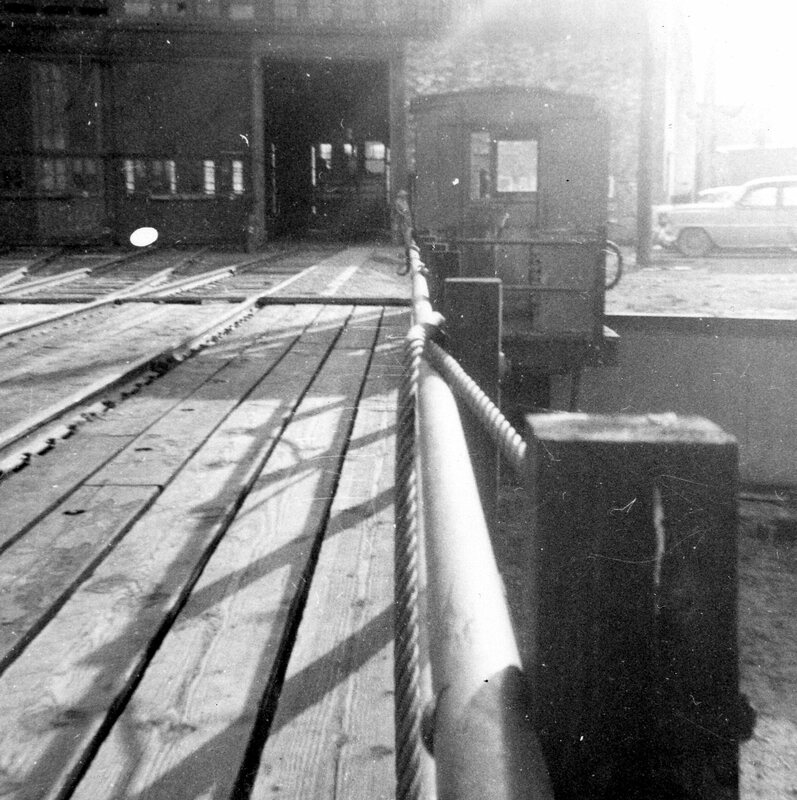 Sometimes we’d climb over or under the couplings between box cars to get to the other side. We must have been pretty observant to not get trapped, injured, or killed while doing that. When we tired of playing outside we moved to the Roundhouse. Steam locomotives needed a lot of routine maintenance to keep them running. 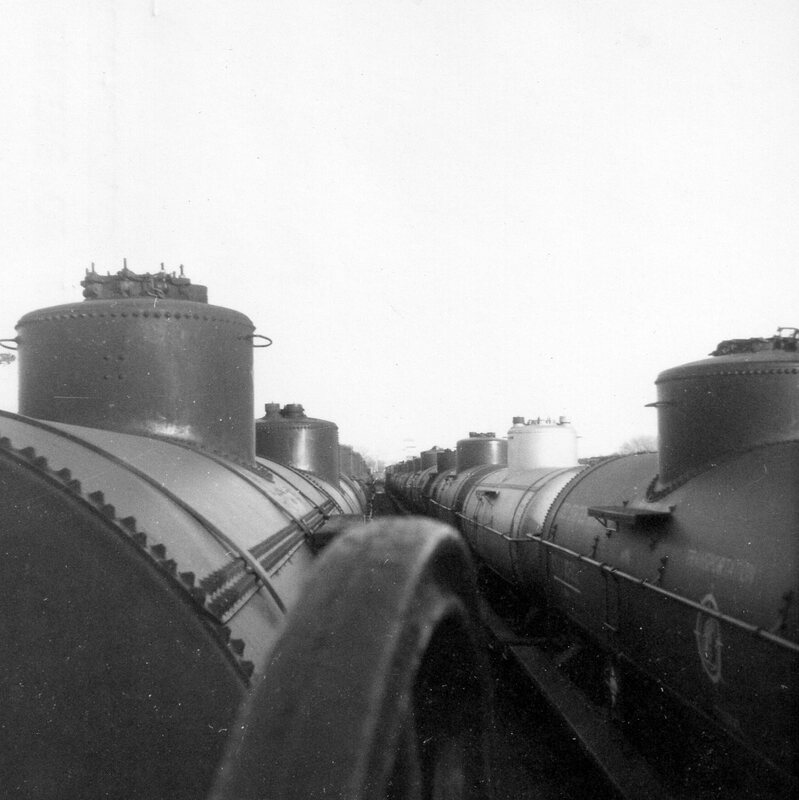 These engines were serviced every hundred miles or so; refueled with coal, water and sand. Frequently, they needed mechanical service that took skilled engineers and specialized equipment. Hostlers drove the engines across a turntable into the roundhouse for that kind of service. The doors to the roundhouse were never locked. At least we always found a way in. We’d wander around, marveling at the huge road engines, gawking at the new diesel switchers, and scanning for anything that we could pocket, but most tools and parts were far too big to fit in a boy’s blue jeans. 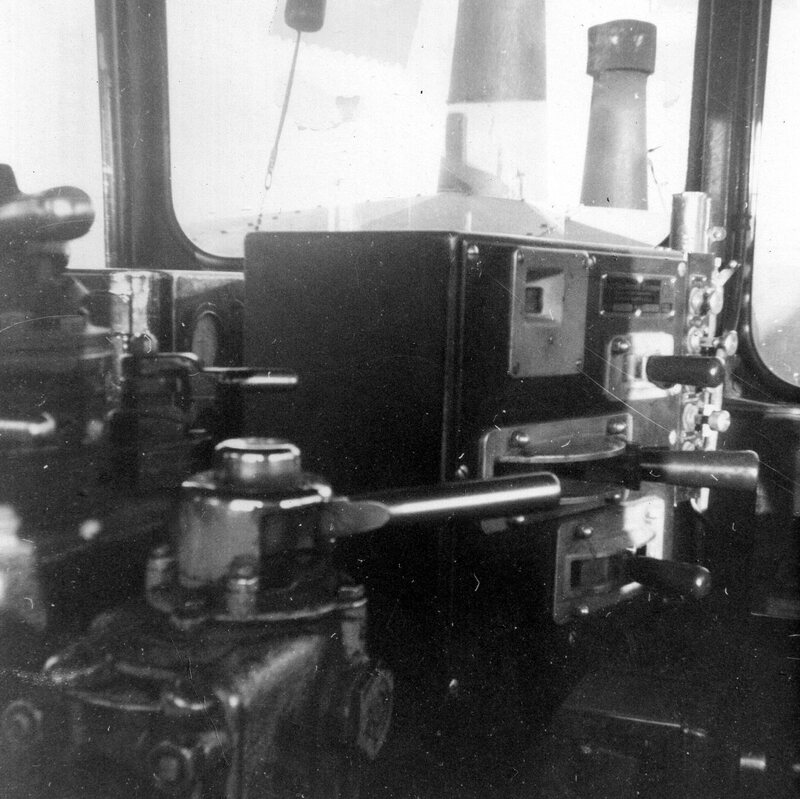 For thrills, we’d climb into the cab of an engine, but we didn’t take that dare very often. Even scarier were the pits that gave access to the underside of the engines. Darkness, dampness, and grease ruled down there. I don’t think we ever took that dare. Where were the workers? Security? I don’t recall ever seeing one. Did they ignore us? Did we only visit off shift? Why didn’t we get hurt? I cannot imagine letting my grandchildren wander into that environment unattended. Those were different times. By the time I was in Junior High, the railroad moved into my basement. I’d been bitten by the model railroad bug. My layout was an HO, my friend Mark Swartzell had an S-scale operation in his basement. Fifteen years later the railroad bug followed me to Rochester, where Lon and I built another, larger, N-Scale layout, complete with dozens of cars, a dozen buildings, a hundred feet of track, and several engines. I can’t tell you how many hours we spent in the basement building, planning, painting, and playing with toy trains. Finally, just to my right as I write this, on the bottom shelf in my office, rests a plastic travel bag. Jim bought it for me at an antique shop in Jamestown a long time ago. Every time I look at it memories jump into my consciousness. The side of the bag reads: “Northern Pacific Railway Vista-Dome North Coast Limited,” complete with the NP Monad. Sixty years of railroad memories. Today Rochester residents don’t value the railroad. All it does is block traffic a couple of times a day. The only time the news carries a piece about the railroad seems to be when an oil train catches fire. The last time I was on a train was twenty years ago in Europe. Closer to home, all the train stuff Lon and I collected over the years is now in plastic tubs in the basement, and anything that didn’t fit in the tubs is scattered about the house. Nobody has looked at any of that stuff for years. Here’s the offer: If you are the least bit interested in picking up a fun hobby, or if you’d like to make some easy cash selling things on eBay, be the first to call me about the train stuff. If I haven’t thrown it out by then, stop over and take it off my hands. Note: I took the photos on this page with a brownie camera in 1962, age 12. Click on a picture to enlarge it. This entry was posted in Guy's Letters and tagged Jamestown ND. Bookmark the permalink.